AirDroid is one of the best smartphone mirroring tools, and there are hardly any AirDroid competitors. AirDroid is pretty good if you are looking for an alternative to transfer files between your computer and mobile without a cable or want to mirror your phone. If your computer and mobile are connected to the same network in most cases, the free version will work perfectly for you. But if you want the most out of the web-based connection, it is good to pay for the premium version. There are hundreds of ways you can transfer files between your computer or laptop and your smartphone. The simplest being connecting your smartphone with your computer using a data cable and start transferring files. But the easiest thing might not be convenient every time. There isn’t any doubt that is the fastest way of transferring files but sometimes you might not be having any cables around to start transferring those important files. As most laptops and computers come with Bluetooth connectivity options, it is also a great way of transferring files and do other activities wirelessly. But that isn’t the fastest. That being said, using mirroring applications is the best way of transferring files between a computer and smartphone wirelessly, with not so bad speeds. It is more convenient than data transfer using cables and is faster than Bluetooth connections. Airdroid can use with any system for example Windows 10,8,7, XP; MacOS, Linux or any OS that has a browser. Thus, mirroring applications actually bring the best of both worlds. AirDroid is one of the most popular mirroring applications, which I am using for almost 3 years now, and it is the best mirroring application you can use. Though it has some cons. So, I will be writing a to the point Airdroid review to know about the goods and bads of it. Yes, a short review. So let’s get started with the tutorial. Support file transfer over the local network and the internet. Support viewing messages and giving a reply over the network. Supports taking screenshots of the device remotely. Supports accessing the camera of the device remotely. Supports music and video management of the remote device. That was all about the features. How to install and use the Airdroid? 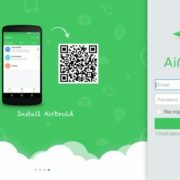 You can read this article(Remotely Control Android Smartphone) to know more about how to use AirDroid. You can download AirDroid Android app here and can get the AirDroid PC download here. Now let’s have a look at the pros of the product. Very easy and simple user interface and none of the users should get into troubles while getting started with it. Very easy and simple to get connected. Just type in the IP Address or visit web.airdroid.com and scan the QR Code to get started. Easy to transfer files without any kind of limits as long as the computer and smartphone are connected to the same Wifi network. It makes the local AirDroid connection the best alternative for wired data transfer. The Airdroid desktop app is also available, which can be handy if you use AirDroid a lot, or want to get the most pro benefits if you have paid for the premium version of AirDroid. Apart from managing files on the smartphone, it is easy to manage various other elements on the smartphone, which include photos, videos, music, ringtones, camera, apps, etc. Thus, you can manage almost everything from your computer with it. 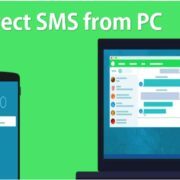 Offers very easy clipboard syncing and text sending feature, which can be handy to send links and important items from your computer to the smartphone to access them later when you get time. Offers support for finding your lost device, which is pretty handy in case you lose it. This feature will work only when the devices are connected to the internet. 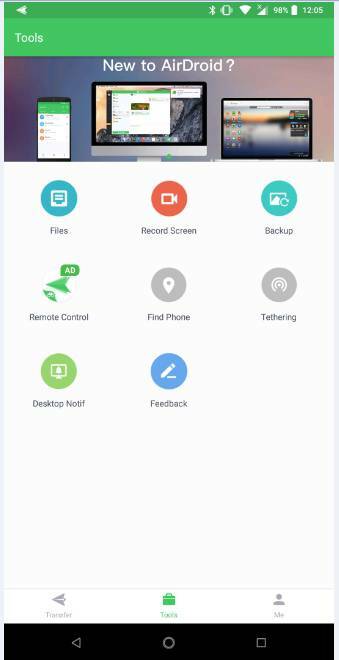 The AirDroid mobile app also offers some handy features like screen recording, sending files from one Android device to other, device backup and other similar things from the ‘Tools’ section. So those were the pros of using AirDroid. Almost all the features are free from any bugs, which eventually offer great performance. Now let’s have a look at the cons of AirDroid. There is a huge limitation on sending files on AirDroid free through the web. The individual file size limit is 30 MB, and there is a limit on total transfer of 200 MB per session. You will have to get the premium version to get over the limitations. The premium version also comes with an individual file size limitation of 100 MB on the web version, and the Android Premium for PC desktop app can get over the limitation to transfer single files of 1 GB. That is still a disappointing size, which can be transmitted. 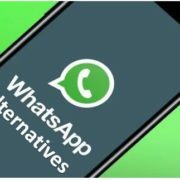 Mirroring for WhatsApp or other popular messaging applications is not supported. That’s a big con. Who do send and receive a lot of SMS messages these days! 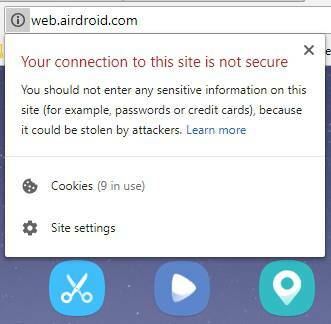 It is not possible to access the camera of your smartphone through AirDroid web if you are connected through the internet. To get that, you will have to get the paid premium version. The free version doesn’t come with the option to transfer folders to the remote device. The premium version is necessary for that. AirDroid is not a paid once and enjoy forever service. To get the premium AirDroid account, you will have to get the monthly or yearly subscription. It is almost Rs. 140 per month, and will be Rs. 1,980 if billed annually. Thus, if you do not need to transfer a lot of files, the free ad-supported AirDroid is the best for you. Logging in over the internet by scanning a QR Code is not the fastest. Even after scanning I had to wait a few seconds before the connection becomes successful. The connection between the computer and smartphone is not secure. 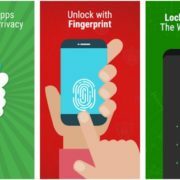 Thus, I will always recommend you to use a VPN on both your computer and smartphone before you start using AirDroid for transferring files over the internet. I will not even recommend the local connection mode on insecure and unknown WiFi networks. I have also seen a number of reviews of AirDroid complaining about its security. The AirDroid AirMirror feature is pretty slow. It takes a lot of time to start. Moreover, that is limited to a web connection, and you cannot use the feature on a local network unless you are connected through web.airdroid.com. That was all about the cons. Obviously, none of them are deal breakers. AirDroid is pretty good if you are looking for an alternative to transfer files between your computer and mobile without a cable or want to mirror your phone. If your computer and mobile are connected to the same network in most cases, the free version will work perfectly for you. But if you want the most out of the web-based connection, it is good to pay for the premium version. AirDroid is one of the best smartphone mirroring tools, and there are hardly any AirDroid competitors. But if your question is, is AirDroid safe, it is not completely so. But there is hardly any smartphone mirroring tools which offer a bug-free user interface with such cool features. All these make AirDroid the best of its class with a few cons. The cons are never going to be a deal breaker. Hope the short AirDroid review was helpful for you. Did I miss out any great feature, or a big pain giving con? Feel free to let me know about it in the comment section down below. Airdroid can use with any system for example Windows 10,8,7, XP; MacOS, Linux or any OS that has a browser. Thus, mirroring applications actually bring the best of both worlds. Though it has some cons. So, I will be writing a to the point Airdroid review to know about the goods and bads of it. Yes, a short review.